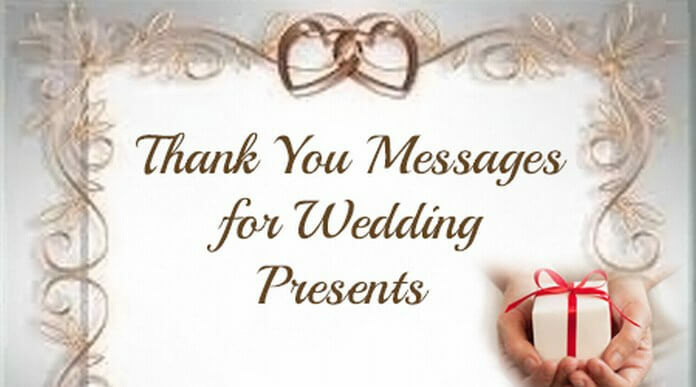 Wedding presents are brought by the guests and attendees of the wedding ceremony. The presents are brought in form of cash or kind as an act of love and care for the wedding couple. As such, the couple sends thankful wishes for the guests through texts. 1). Dear guest, thank you for gifting us such a lovely wedding present. We would treasure such a prized collection with all our heart and love. 2). Thanking my cousin for the beautiful dinner set wedding present. It is truly a beautiful crockery set and would keep it treasured like anything. 3). Thanks to my sister for the awesome wedding present. The vacationing trip package you gifted is much special for us and your love for us too is truly exceptional. 4). I thank my guests for the wedding presents you all gave us. It was indeed lovely to have you all beside us for the ceremony as we united in marital bliss. 5). Thanking all my guests for your wedding presents on the ceremony. I hope you all enjoyed the rituals and the events lay out and also blessed us for a happy conjugal life.